Greece also belonged to the first group of countries using the Euro currency, after joining the Eurozone in 2001. Despite not meeting the Maastricht convergence criteria, Greece was allowed to join for political reasons in order to assure the currency’s success, similar to other countries. Greece’s population is almost 10.8 million or 2.4% of all EU citizens (after Brexit). 21 or 3% out of all 705 Members of European Parliament (MEP) will be elected this year in the country. During the last 2014 EP elections, the percentage of people that went to vote (60%) was way above the EU average of 42%. Public opinion about the EU has been greatly affected by the Euro crisis: just 45% believe the EU is a good thing, while 20% disagree and 35% is indifferent. Moreover, the Greeks are the least satisfied with the way in which democracy works in the EU (30%). Greece’s population arguably suffered the worst following the financial and Euro crisis. It lost over 25% of its GDP and required three financial bailout rescues. While these came to an end finally in 2018, the economic situation remains precarious, and the consequences of austerity are still widely felt among the population. This despite the fact economic growth returned in recent years and forecast to continue according to the EC’s latest autumn and winter forecasts. Between 2014-2018, Greece’s economy grew 0.7% on average annually (real GDP), way below the EU average (2.1%). However, it grew 2% last year and forecast to grow 2.2-2.3% in 2019 and 2020. Greece’s total GDP stood at €180 billion in 2017, which is 1.4% of total EU 27 (without UK) GDP. Per capita, this amounts to a real GDP of €17,400 in 2017, which is the same it was in 2000 before joining the Eurozone, and way below the €27,700 EU28 average. While in purchasing power standards (PPS), Greece’s per capita GDP used to be close to the average, it is now just 67% of the EU28 average. Unemployment remains the EU’s highest with 19.3%, nearly triple the EU28 average of 7% (in 2018). Nonetheless, it came from a rate of 27.5% in 2013. Much worse is the fact 39.8% of young people remained unemployed in 2018 (which was 58.3% in 2013). Another worrisome fact is that Greece remains one of the most corrupted countries in the EU, currently ranking 2nd after Bulgaria. Whereas Greece has historically been considered the cradle of democracy, the current Third Hellenic Republic with its unicameral parliament is based on its 1975 constitution (approved by referendum) that abolished its monarchy and restored democracy that was interrupted (1967-1974) by a military junta. The most important figure is the Prime Minister, as the Head of Government. The Head of State is the President, who has had a more ceremonial and symbolic role after 1986’s constitutional reforms. The Eurozone crisis hit Greece particularly hard, prompting a sharp decrease of the average income and increase of unemployment and inequality, as economic and social conditions in the country severely deteriorated. The three Economic Adjustment Programs (as the bailouts are officially known), worsened Greece’s economic downturn and further deteriorated its welfare state. Citizens put the blame on the political system but especially on the major political parties, the centre-left Panhellenic Socialist Movement (PASOK) and the centre-right New Democracy (ND). PASOK and ND governed Greece interchangeably since the restoration of democracy in 1974 as part of a traditional two-party system. As poverty increased and people saw their incomes diminishing, the Social Contract, which kept the system in place, collapsed. New parties emerged, and smaller parties rose with the subsequent political fragmentation. ND saw many of its voters turn to extreme right-wing parties, like the ultranationalist Golden Dawn, which rose from an extra-parliamentary fringe group into the third biggest party in the Greek Parliament in 2015. PASOK took the heaviest blow and saw its support plummet from 44% in the last elections before the crisis in 2009 to 4.7% in the parliamentary elections of January 2015. The greatest beneficiary of this was SYRIZA, a coalition of small leftist groups, which rose from 4% in 2009 to win in January 2015 with 36% of the votes, subsequently forming a coalition government with the small right-wing populist party “Independent Greeks”. SYRIZA’s ostensible opposition to the financial bailouts’ conditions led it in conflict with the Institutional Troika responsible for those and other EU Member States. Following months of fruitless negotiations and with the prospect of defaulting Tsipras called for a referendum on whether the country should accept a third bailout. While an overwhelming majority voted against, Tsipras accepted the bailout and called snap elections, which he won and cemented his power by forming another government with the “Independent Greeks”. The government coalition remained together until recently, when the Independent Greeks broke-off over the protest to the treaty signed between Greece and the Republic of Northern Macedonia, resolving the long-lasting dispute between the two countries. 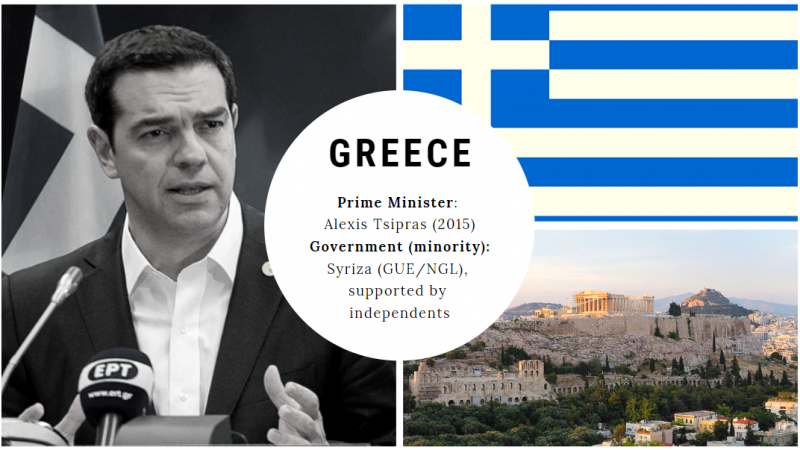 Tsipras is now heading a minority government, supported by a handful of non-aligned MPs. The upcoming EP elections will serve as a thermometer for his support, as the country is also already in campaign mode for national elections planned for September 2019. Overall, the economic crisis that engulfed Greece changed radically its political system, leading to the demise of traditional parties and the emergence of new and more radical ones. ND survived but PASOK was demolished and effectively replaced by SYRIZA. Politics in Greece are known for their unpredictability, and estimations on voter’s preferences should be taken with a grain of salt. Moreover, the European elections coincide with municipal and regional elections, which means citizens will take many factors into consideration. Moreover, PASOK, which is leading a coalition of centre-left forces under the name “Movement of Change” (KINAL), will win just 2 seats for the Progressive Alliance of Socialists and Democrats (S&D). Both the ultra-right Golden Dawn and the Greek Communist Party (KKE) – that do not belong to any of the larger European political groups – are expected to win 2 seats each. A new extreme right-wing party called “Greek Solution” is projected to win 1 seat. Other parties are not expected to pass the electoral threshold of 3%. The “wild card” in this case is the number of undecided voters, currently placed somewhere between 10% and 20% of the electorate. In any case, ND hopes that citizens will use the elections to show their dismay towards the government, with its leader Kyriakos Mitsotakis calling it a “referendum”. On the other hand, for Tsipras it is a test of his electoral power before national elections in September. For both though, is it seen as the first round in the upcoming decisive fight for power. Nikolaos Koutsimpogiorgos is a PhD Candidate at Utrecht University. He holds a double degree master in European Governance.